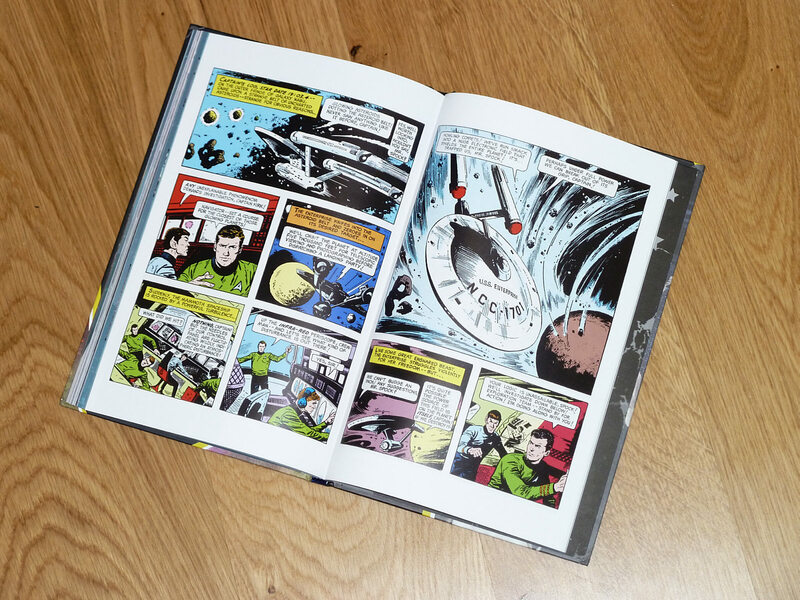 The Star Trek Graphic Novel Collection is an anthology of Star Trek graphic novels and comics, published by IDW for Eaglemoss Collections. The collection comprises a wide variety of previously released works, from the Gold Key comic series of the 60's to the recent graphic novels related to the Abrams reboot movies. 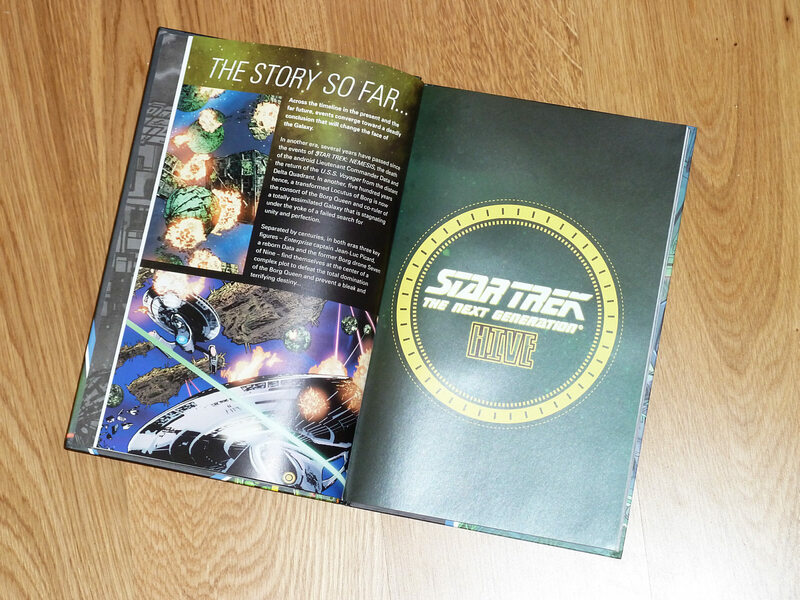 It remains to be seen how complete the coverage in the Star Trek Graphic Novel Collection will be in the end. As far as the announcement goes, it will include all fan favorites and the big names among the writers. 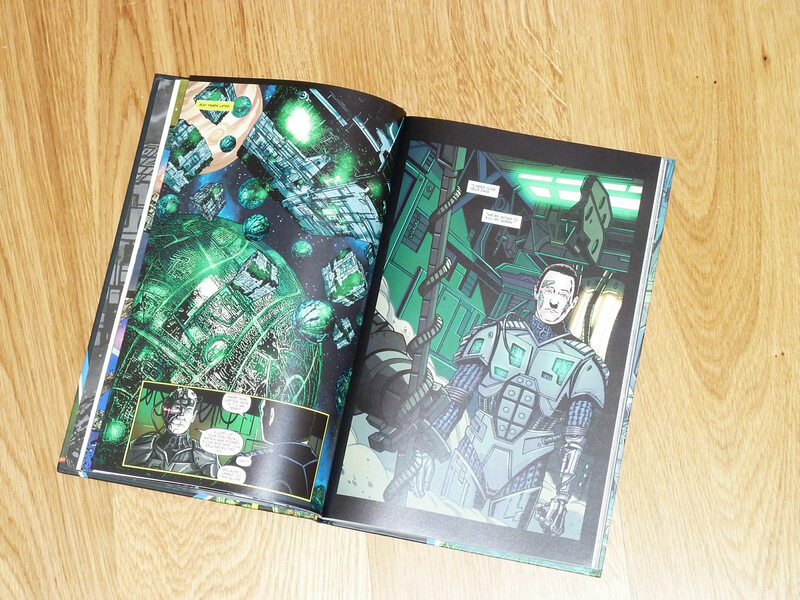 Each issue comes in hardcover format and consists of a main feature (usually a graphic novel) with a new introduction and a bonus (such as a Gold Key comic). 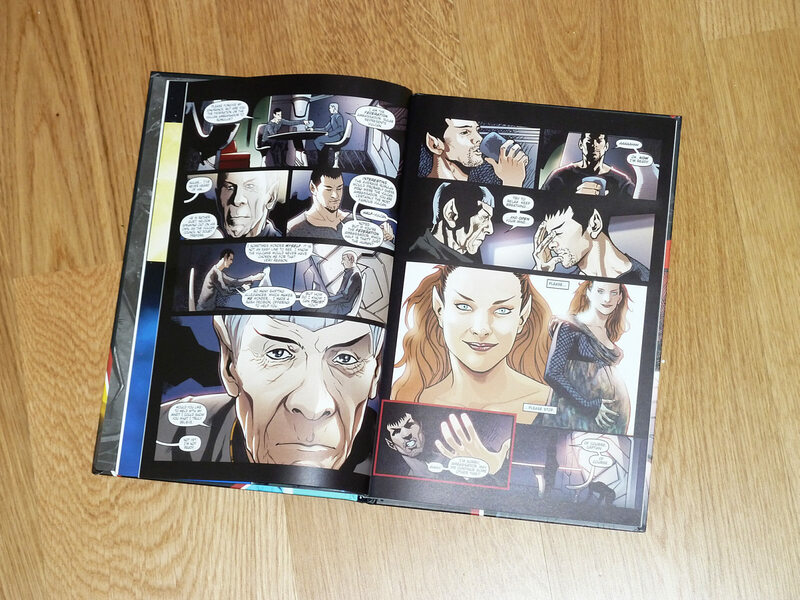 The Star Trek Graphic Novel Collection starts with a graphic novel that can be considered a must-have for fans of Trek comics. 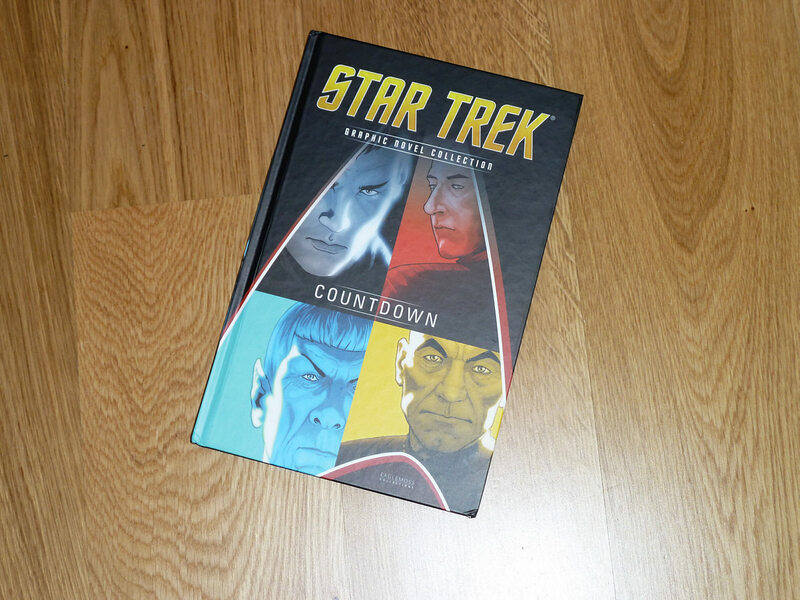 The four parts of Countdown were originally released by IDW in the months before the premiere of "Star Trek (2009)" and became a huge success. Co-written by Roberto Orci and Alex Kurtzman, who were also responsible for the script of the movie, Countdown tells what happened or what could have happened right before the Narada pops up in the 23rd century in "Star Trek (2009)". Roberto Orci himself insinuated at one time that his Star Trek novels may be considered canon, a view that he revised on later occasions. In any case, Countdown adds a number of useful facts to the story of the movie. We learn that Spock's unnamed ship is the Jellyfish, that Nero and his men got the tattoos instead of traditional painted signs of grief and that his ship was upgraded with Borg technology at a secret Romulan facility. 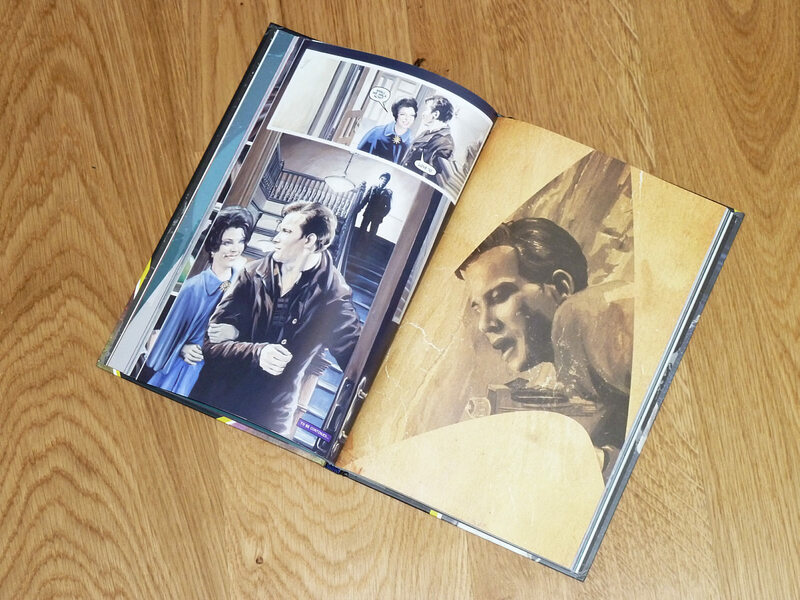 Unfortunately these bits of information and ultimately the very existence of the graphic novel was used by some people to put down any criticism of the movie from the outset, along the lines of "it's all explained in Countdown, it's all canon, it's all perfectly plausible, you have no right to nitpick". Those people ignored that, even if Countdown were canon, it solves only a few of the many mysteries raised in the movie, and that it creates a couple of new inconsistencies. Although the graphic novel is certainly not to blame for the way some people interpret it, for me this cast a shadow over Countdown for quite some time. But after the dust has settled, it's time for me to enjoy it irrespective of its alleged or true canonicity. Countdown does have a good story, a story that makes sense with some caveats, with wonderful characterizations of Nero, Spock and the former Enterprise-D crew. It was written by people who knew their Trek. It doesn't feel like it was penned by Orci and Kurtzman to exonerate themselves from possible mistakes in the movies but rather like a supplement that they created because they were so excited about it (and also because it had the potential to make money, of course). My favorite part is when Spock begins his address to the Romulan Senate with an ear joke (which earns him some laughter of the kind he wouldn't get on Vulcan). As I mentioned, a few things in the movie make even less sense after reading Countdown, such as Nero's weird fixation on Spock, the man who became his friend and who did even more to save Romulus than is apparent in the movie. Another letdown about Countdown is even more obvious. 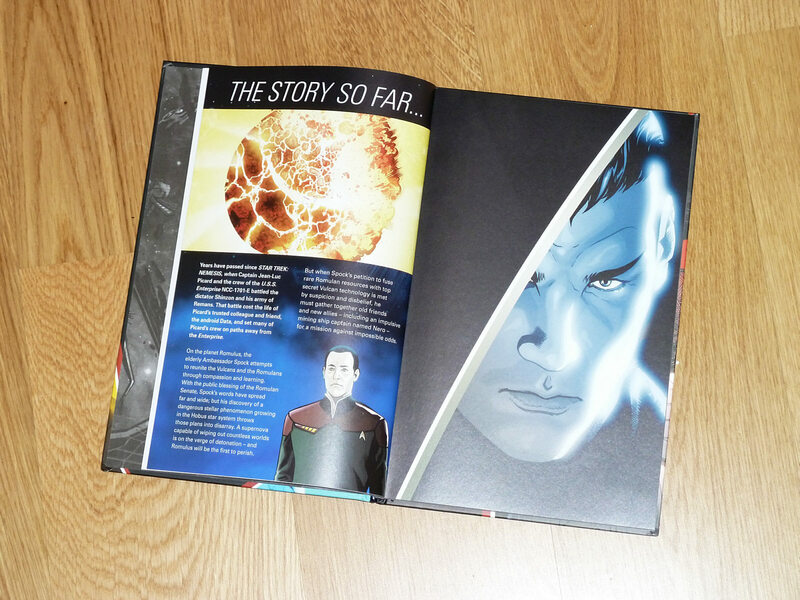 Although it doesn't have "The Next Generation" in the title, the graphic novel is written like a TNG story. The problem is, the crew of the Enterprise is scattered since the events of "Nemesis". The story brings together Data (whose Enterprise-E happens to be close enough to help Nero in distress), Picard (who happens to be Ambassador on Vulcan), Geordi (who happens to have that ultrafast ship) and Worf (who happens to command the fleet sent to take on Nero) in a seemingly endless chain of coincidences, which doesn't work with me. This also unpleasantly reminds me of a very similar way to unite the "required" people in "Star Trek (2009)". The artwork of Countdown by David Messina is superb. I like the predominant darkness, which fits the theme of death and grief, and the toned down color palette. The attention to detail is remarkable, and the likeness of the characters is captured very well. Especially Spock is drawn like we look into Leonard Nimoy's face. 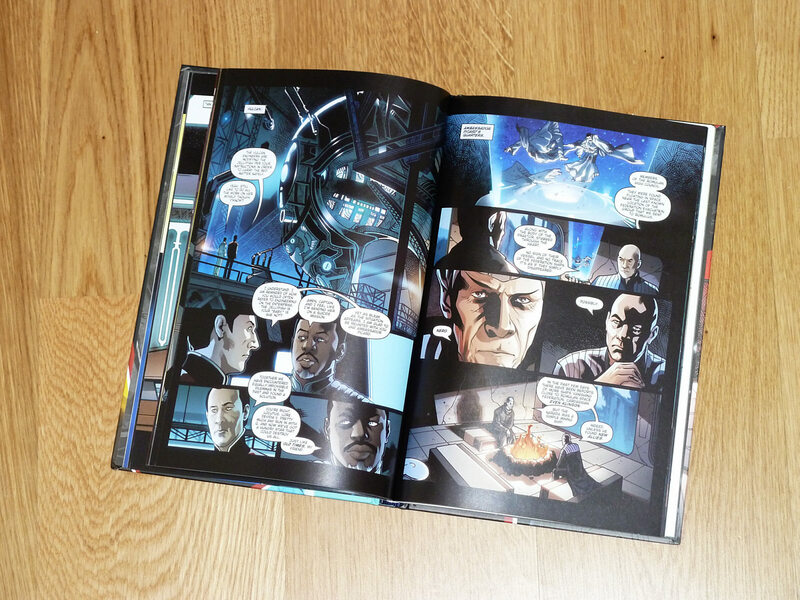 Summarizing, Countdown is one of the best Star Trek graphic novels, not simply because of its affiliation with the movie "Star Trek (2009)" but rather because of its excellence in writing and illustration and despite the implausible fixation on TNG characters. 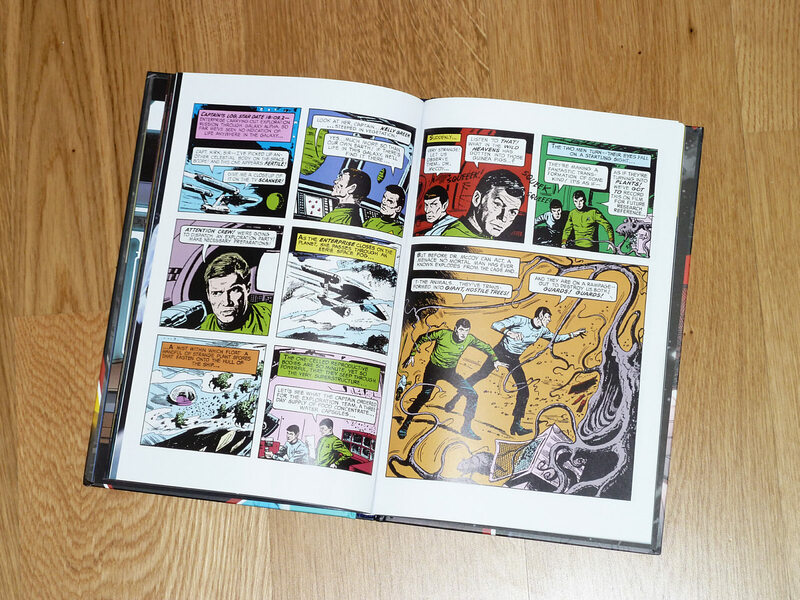 The Star Trek related Gold Key comic series was launched as soon as 1967. The Gold Key stories famously differ from the TV series in several regards. The shirt colors don't match as Kirk and McCoy wear green, while Spock's shirt is blue. Beaming is called "teleportation" and phasers become "lasers". In the first story, titled The Planet of No Return aka K-G, Planet of Death, the Enterprise explores the planet K-G in Galaxy(!) Alpha and runs into spores that transform animal life into plants. In the end, Spock sees no other alternative but to obliterate the whole surface of the planet of the moving trees. This is certainly in contrast to what Spock may have done in TOS. Gold Key has the same problem as many pioneering secondary works, that it doesn't get the tone of the original quite right. Despite this deficiency, reading this comic is enjoyable (and if only because of the nostalgia). 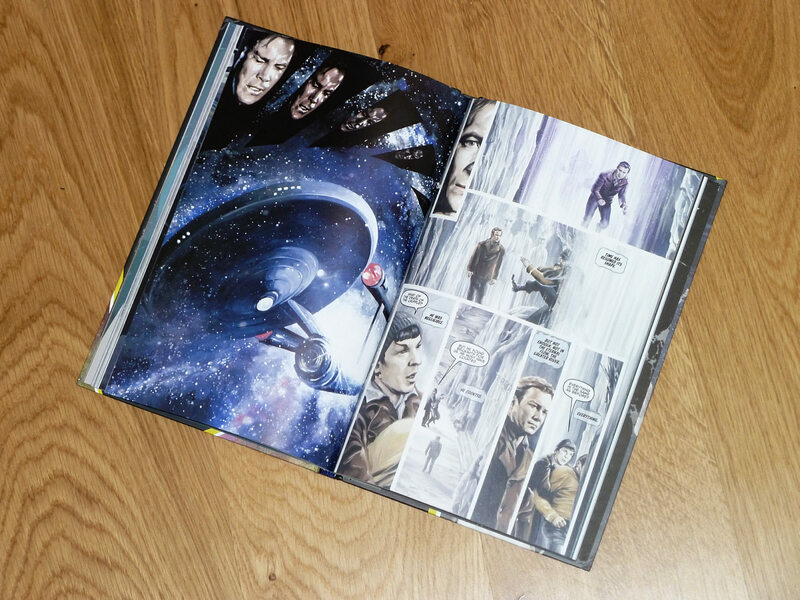 Star Trek Graphic Novel Collection, Volume 1: Countdown, IDW for Eaglemoss Edition, 2016. In the vicinity of an unexplored planet the clocks on the Enterprise are running backward for some unexplained reason. Enterprise crew member Lieutenant Beckwith sells "jewels of sound", a kind of psychoactive drug. When his customer threatens to blow the whistle, Beckwith slays him and uses the transporter to escape to the planet. A search team follows him and discovers some sort of city on the otherwise dead planet where they are greeted by the Guardians of Forever. The Guardians have erected a time portal that would allow anyone to visit any time on any planet. Kirk asks the Guardians to show the past of Earth. Beckwith, who has been hiding in the city, storms towards the portal and is transferred to Earth's past. The Guardians announce that Beckwith has changed the course of time. The landing party decides to beam up anyway, but instead of the Enterprise, they end up on a renegade vessel named Condor. Janice Rand is put in charge of defending the transporter room against the crew of the Condor, while Kirk and Spock beam down to the planet again. They ask the Guardians to send them to a time before Beckwith arrived on Earth. So Kirk and Spock find themselves in New York of the early 1930's, the time of the Great Depression. They get jobs, and Spock attempts to repair the tricorder, whose circuits were overloaded. They keep looking for the focal point of time, which was described by the Guardians as "blue... and the sun will burn on it". Spock spots social worker Edith Keeler, who wears a blue coat with a sun brooch. He does not find out the details, but he concludes that she has to die in order to repair the damage to history. Kirk moves into an apartment next to Keeler's, and he falls in love with her. Then Beckwith appears, but he escapes and kills a beggar, who was working as an informant for Kirk. Later, Edith Keeler is about to cross a street, and Beckwith tries to save her from an approaching truck. Spock holds back Beckwith, and Keeler is killed. Kirk and Spock return to the 23rd century, whereas Beckwith is caught in an exploding sun forever. History is repaired because Edith Keeler was important, whereas the beggar wasn't. This graphic novel was written by Scott and David Tipton and drawn by J.K. Woodward in collaboration with Harlan Ellison, and was first published by IDW in five issues in 2014. It is an adaptation of Ellison's original teleplay for the famous TOS episode "The City on the Edge of Forever". It differs from the eventually produced episode on many accounts. Gene Roddenberry argued that the changes to Ellison's script were necessary because he couldn't afford to build the extensive sets described by Ellison, and because of the delicate topic of drug abuse. Ellison, on the other hand, was so angry about the rewrites that he demanded his screen credit to be changed to the pseudonym "Cordwainer Bird" as a sign that he disapproved of it. Gene Roddenberry, however, denied him the change of the credit. 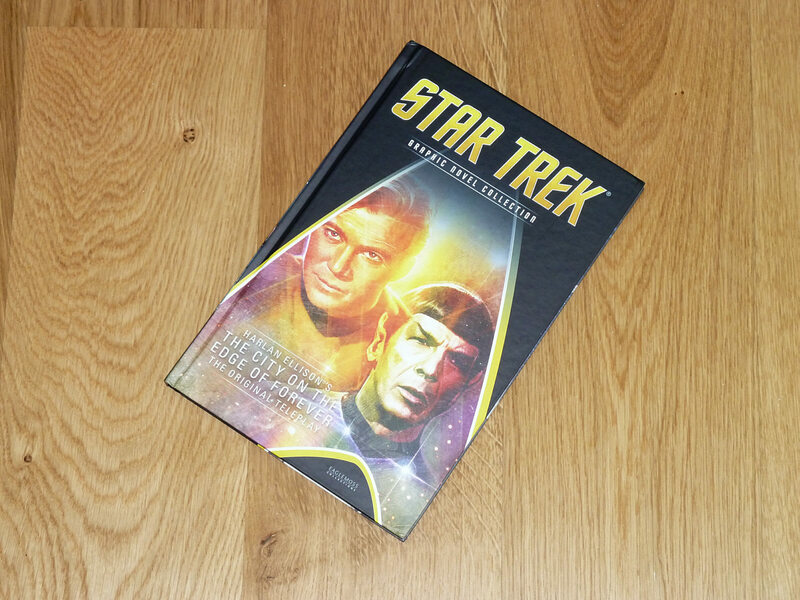 The feud between Ellison and Roddenberry continued for many years, and Ellison apparently maintains a critical stance on the Star Trek franchise still today. 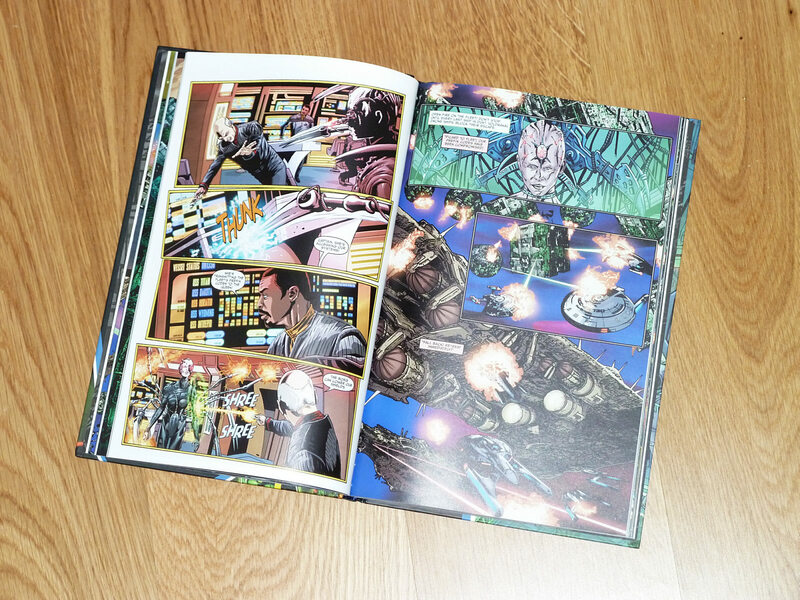 As a sort of disclaimer, it is not up to me to judge Harlan Ellison's motivation to publish the graphic novel based on his original teleplay for "The City on the Edge of Forever". As a Star Trek fan, I simply don't need attempts to better an episode that is among the very best ever made. But it is an interesting thought experiment to see the story visualized the way it was originally meant to be. And if anyone is entitled to try to change our perception of this classic story, then it is Harlan Ellison. In Harlan Ellison's original version a drug dealer named Beckwith runs amok, rather than McCoy. I can understand that in his effort to depict a positive future, Gene Roddenberry disapproved of the theme of drug abuse in the 1960's. TOS had a commentary on drugs in "Mudd's Women", but having a crew member of the Enterprise as a drug dealer definitely gives the problem much more weight, and too much in Roddenberry's view. The adaptation of Harlan Ellison's work shows that it could have worked nonetheless. In my view, the problem with Beckwith's drug deals is another one. It unnecessarily sidetracks the story, without having consequences. Whether Beckwith was dealing with drugs or not before he killed that fellow crew member and ran away has no bearing at all on the story that ensues. On the planet, the landing party find a "City on the Edge of Forever" that is really some sort of city in Ellison's version and makes more sense than in the TV episode (where the city in the title might refer to New York, though). Also, in the original teleplay the Guardians are real people, or at least statues or projections of people. This gives the landing party's "encounter with eternity" a somewhat more personal touch than in the TV episode. What I don't like is the verbosity of the encounter. Kirk and Spock keep asking questions all the time, and the Guardians keep telling their story of what happened or didn't happen for billions or millions or thousands of years. One interesting aspect the Guardians mention, however, is that time is flexible and can handle minor changes made in the past. This will play a role in the following. After Beckwith has vanished, the Guardians announce that everything has been changed and that Kirk and the landing party are in a new universe. Although it would be more plausible if the ship were simply gone and although in hindsight it is too reminiscent of "Mirror, Mirror", an episode that was produced for the second season, I like the idea that after beaming up Kirk, Spock and Rand find themselves on a rogue version of the Enterprise. They recognize their error and get control of the transporter on the renegade ship, the Condor. It is noteworthy that Kirk puts Rand in charge of defending the transporter against the crew of the Condor. She obviously has a much bigger role here than in the TV series. It only doesn't make much sense for her to hold the position "indefinitely", because Kirk and Spock have to be successful, and if they are, the universe will be reverted to its original state. On Earth, Kirk and Spock witness the xenophobia of some people of the 1930's, which Spock chides with unusual unfairness: "Is this the heritage that Earthman brag about? This sickness?". Later on, he gets into an argument with Kirk about Earth's past, one that is even on the verge of becoming violent. Throughout the whole rest of the story we can notice a latent animosity between the two, rather than a spirit of working together towards a common goal. I like the Spock of the TV episode better. In Ellison's The City on the Edge of Forever he is out of character, a bit like the Spock who was reverted to a more primitive state in "All Our Yesterdays". Everything related to Edith Keeler is not very different than in the TV episode. We see her spend a bit more time with Kirk, but less of her charity work with homeless people. Actually, in the TV episode not only her dedication to help people is worked out a bit better but also her vision of the future. In both versions Kirk and Spock are amazed how prophetic her ideas are, but only in the TV episode it becomes clear why this is so. Well, her mentions of spaceships that are missing from the graphic novel are perhaps too obvious but ultimately very useful to define her character as somehow anachronistic. 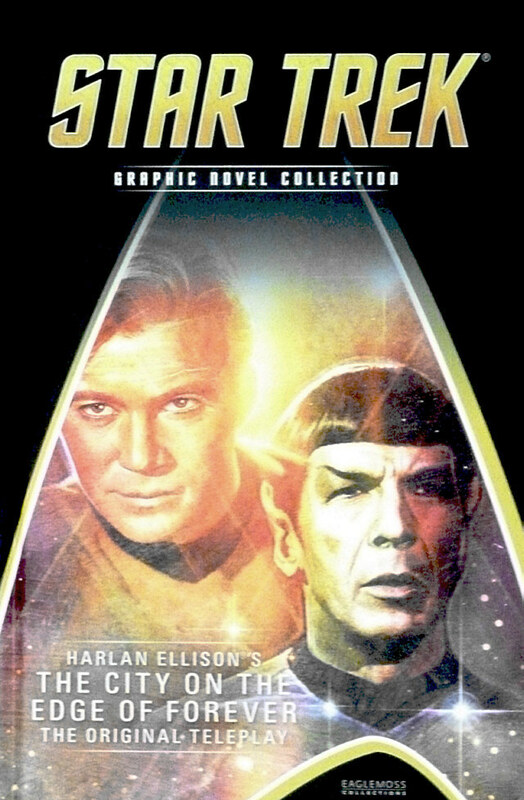 The graphic novel doesn't have the "rice picker" joke that Ellison purportedly hates, but it includes a quite funny bit when Kirk points at a beer truck and mentions the Great Prohibition, and Spock incredulously asks, "Trucks like that are prohibited?". In the end, when history is restored and Kirk and Spock are back in their own time, Beckwith jumps into the time portal again. The Guardians say that this time, "he wanted forever, the vortex has given him forever". This was obviously meant to be an instance of poetic justice, but I don't really understand it, other than "burning forever" being a religious concept. Regarding the art, it was a conscious decision to reproduce all story elements that are the same as in the TV episode the way they appeared on screen. This applies to the look of Edith Keeler (Joan Collins) as well as to many details such as the basement in which Spock and Kirk hide and which was almost exactly reproduced for the graphic novel. The art is fantastic, especially considering that nothing was done with the help of a computer. The impressionist style of the paintings gives this story a quite fitting nostalgic air. 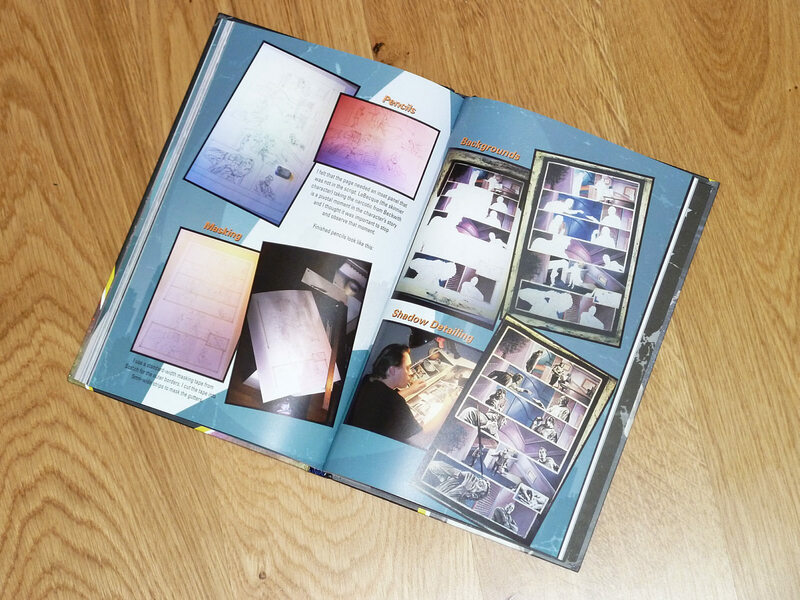 The volume includes a making of, showing the single steps from the pencil sketches to the coloring, and several pages of annotations, explaining design decisions and Easter eggs in the drawings. Overall, The City on the Edge of Forever is a wonderfully drawn graphic novel with a great story, or a great new spin on a classic story if you will. Definitely another must-have. The bonus feature is Gold Key Star Trek #2: The Devil's Isle of Space. The Enterprise encounters a group of marooned people on an unstable asteroid. In reality, they are prisoners who were exiled to the asteroid, which after an unknown time would break apart. This second Gold Key issue too suffers from a lack of willingness to collaborate. The prisoners of the asteroid are not open to reason, and after rescuing the Enterprise landing party the asteroid explodes, killing everyone. Yet, the story may have made a rather good TV episode after a few changes. "Space prisoners" who are left to themselves can be seen in half a dozen Star Trek episodes, but the idea was still quite fresh in the 1960's. 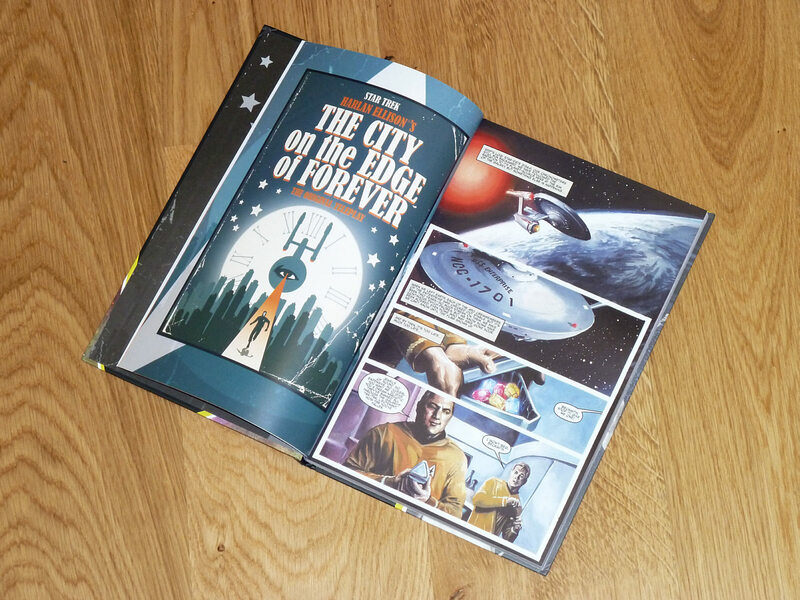 Star Trek Graphic Novel Collection, Volume 2: Harlan Ellison's The City on the Edge of Forever - The Original Teleplay, IDW for Eaglemoss Edition, 2016. 500 years into the future, the Borg have assimilated the whole galaxy. But they have not achieved perfection. Locutus rediscovers his old life as Jean-Luc Picard, and he plots to kill the Borg Queen, with the help of the resurrected Data, in order to correct history. In the late 24th century, a Borg fleet arrives at Earth with the surprising proposal to fight against a common enemy: Species 1881, the interdimensional Voldranaii who are out to destroy the entire galaxy. Captain Picard persuades the admirals to agree on the alliance. The Voldranaii strike and destroy Andoria Prime before a joint Federation/Borg fleet intercepts them. A Vulcan away team led by Worf, however, finds out that the Voldranaii were created by the Borg. On the Enterprise, Seven of Nine accesses the ship's systems and transmits the fleet's prefix codes to the Borg. A few years earlier, she had volunteered to infiltrate the Borg, but now the Queen uses her against the Federation. 500 years later, Locutus and Data kill the Borg Queen. Data gains access to a temporal chamber that Locutus programmed to take him back to the 24th century. Upon his arrival, Data proposes to use a deadly virus against the Queen that Locutus has perfectioned over the centuries. Picard agrees to become Locutus once again, as the Queen would personally assimilate no one else but him. On the Borg ship, Picard delivers the virus as he is assimilated, while Seven, who is dying herself, tries to liberate as many Borg as possible from the Collective. She dies, but not before having rescued thousands of drones. 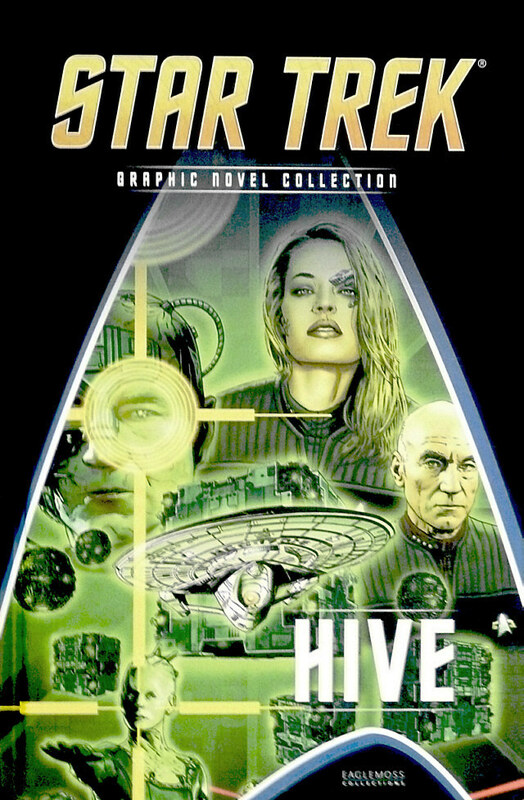 The Hive series was first published by IDW in four issues in 2012-2013. It was scripted by Terry Matalas and Travis Fickett. The story comes from no one else but Brannon Braga, who shaped the post-Roddenberry era of Star Trek as a writer and producer like probably no one else. It is his first Star Trek-related writing credit since the end of Star Trek Enterprise in 2005. Braga may have needed the break from Star Trek, also considering that his work for Voyager and Enterprise was met with scathing (and often unfair) criticism from many fans. Hive shows that Braga still knows his Star Trek. Braga may have remembered too much of his previous work, however. Direct confrontations with the Borg Queen, voluntary assimilations, using a virus against the Borg, going back in time to fix history, it's all been done so many times before. Most obviously the Voldranaii, a gruesome species from interdimensional space that the Borg tried to assimilate in vain and that are striking back, are too much like Species 8472, although the revelation that the Voldranaii were created by the Borg is supposed to justify the similarity in the sense of a red herring. 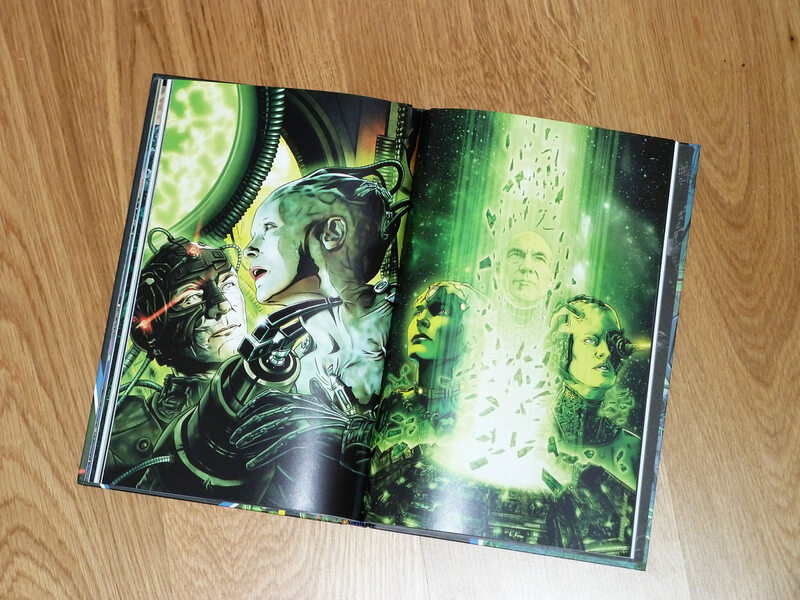 Braga's writing for Hive continues in the same vein as his often criticized Borg stories of Star Trek Voyager such as "Unimatrix Zero" and "Endgame", using the same themes and the same twists. Well, the comic is very thrilling in spite of everything, just as nearly everything that Braga wrote for Star Trek TV series. Hive belongs into the category of Star Trek comics that I am generally skeptical about because they are dark, desperate and violent. This usually doesn't bode well because it is hard to relay the peaceful philosophy of Star Trek and its optimistic view of the future in such a story. I think Brannon Braga was well aware of the problem, and he allowed the positive attitudes of the characters and the benevolent nature of the Federation to resurface at various points of the story. Most notably, the effort to save as many drones as possible is a laudable idea. Even though saving thousands out of trillions doesn't seem to make much sense, I like the symbolic effort that redeems Seven as a character and the Federation as an organization for the people. The art by Joe Corroney is sharply defined and powerful. The facial features especially of Picard and Data are worked out very well. Some of the other characters such as Dr. Crusher are not quite as convincing. The colors are overall rather dark, in accordance with the theme of the comic. Well, and I am delighted it uses the design of the Mediterranean class designed by me at one point, albeit without giving me credit. Overall, considering that Hive is not the type of graphic novel that I usually like to read, I still enjoyed it a lot despite my general reservations and some specific weaknesses of the story. It is clearly better than I would have expected. 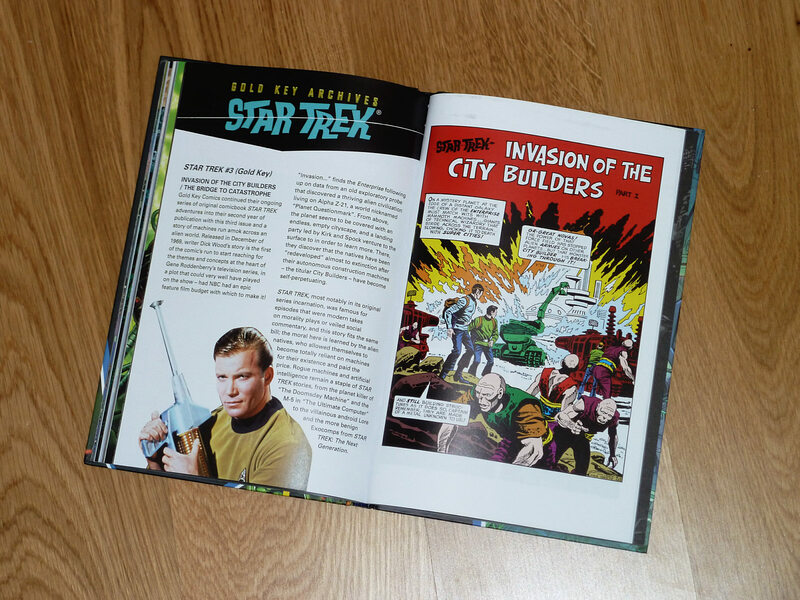 The bonus feature is Gold Key Star Trek #3: Invasion of the City Builders / The Bridge to Catastrophe. The Enterprise discovers a planet nicknamed "Questionmark" that has huge well-maintained cities but no apparent inhabitants. As a landing party beams down to the edge of a city to investigate, they witness how a small group of humanoids try to attack in vain the big machines that extend the city. Their leader, Krill, says that the people on his planet, Zarta, once lived in cities and entirely relied on machines. They constructed machines to extend their cities, but these ran out of control and began to erect buildings without any purpose. The Enterprise crew tries to stop the machines in vain with a large trench and with forcefields. When the machines arrive at a river, they begin to build a bridge. Spock investigates the synthetic metal that is used in the construction and finds a weakness. The metal can be broken apart with amino acid. Krill insists on taking on the bridge alone, and he succeeds. With the help of the Enterprise, the remaining machines are located and destroyed. Invasion of the City Builders / The Bridge to Catastrophe is a positive surprise. 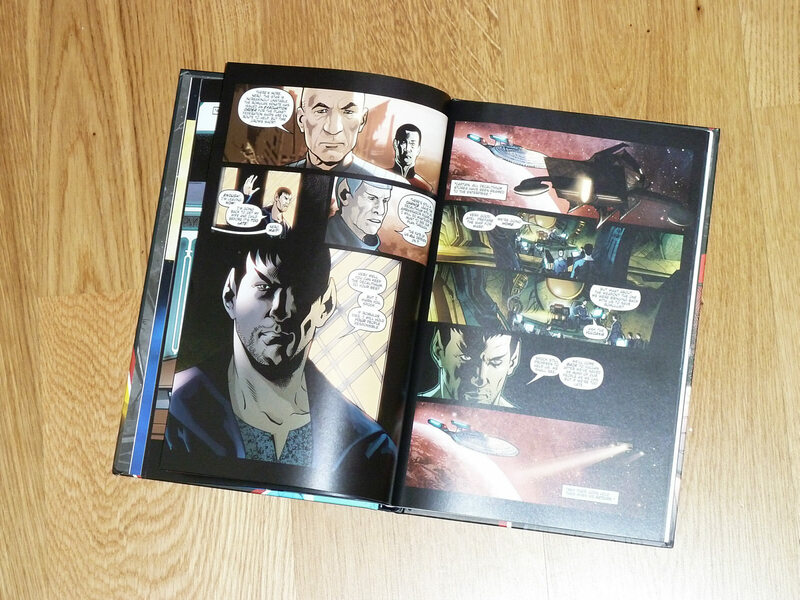 The story is so much better than in the two previous Gold Key Star Trek comics. It comes with a remarkable critique of civilization, and it would have made a great TV episode if the budget for the city had been available. And just on a curious side note, this issue includes even more funny terminology than the two previous ones. The Enterprise has "rocket engines", time is measured in "lunar hours" and "galaxy minutes", the universal language is "Esperanta", and a magnetic tractoring device is known as "magno hook". It is also curious that Spock analyzes data on a tape reel. 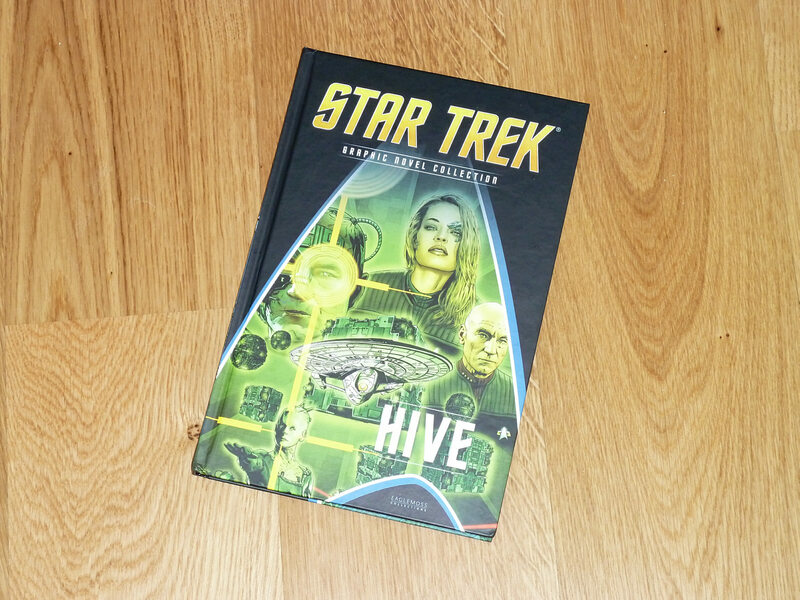 Star Trek Graphic Novel Collection, Volume 3: Hive, IDW for Eaglemoss Edition, 2016.